Eric Beetner is an award-winning short story writer and author of several novels including The Devil Doesn't Want Me, Criminal Economics, White Hot Pistol, Dig Two Graves and he co-authored the novels One Too Many Blows to the Head and Borrowed Trouble with JB Kohl. He has also written two of the popular Fightcard novellas under the name Jack Tunney and the Schlockzone novella Stripper Pole At The End Of The World. He has published over 60 short stories online and in print. For more info go to ericbeetner.blogspot.com. A two fisted, gun toting Private Eye! A Member of the French Foreign Legion waist deep in Intrigue! A Lady with a taste for Diamonds and Danger! Heroes many have thought lost to yesterday now blast their way into today in BISHOP AND HANCOCK’S PULSE FICTION! 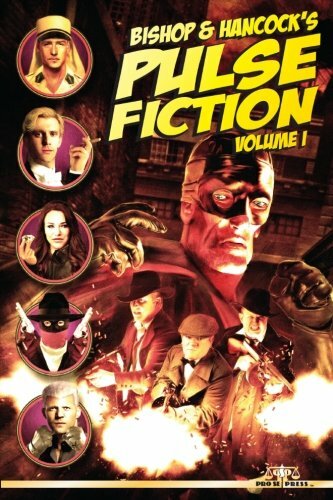 A Concept conceived by noted author Paul Bishop and contributed to by author and publisher Tommy Hancock, PULSE FICTION takes the best of the past and shakes and stirs it with today’s finest Genre Fiction writers! Encounter a cast of characters created by Bishop and Hancock and written into four color, over the top life by Eric Beetner, Barry Reese, D. Alan Lewis, Brian Drake, James Hopwood, and Hancock. Just like the bygone magazines of the past, PULSE FICTION brings rich, vibrant characters embroiled in death defying adventure to readers, characters that will return in later volumes crafted by these and a whole myriad of other authors! Want stories that will get your heart racing, your blood pumping? You’ll find them here in BISHOP AND HANCOCK’S PULSE FICTION VOLUME ONE!